Using Scoped Assignments with Periodic Snapshot Fact Tables – did i say that?! You agree to store snapshot data on a daily, monthly and yearly basis. 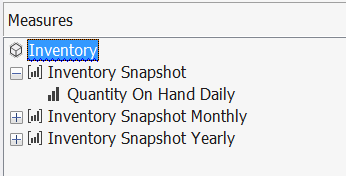 Data from the last daily snapshot of the month will be stored as the monthly snapshot. Data from the last daily snapshot of the year will be stored as the yearly snapshot. The last 31 daily snapshots will be retained. The last 12 monthly snapshots will be retained. Yearly snapshots will not be deleted. The retention policy described above allows you to have quite a bit of coverage at different levels of detail (grain), keeping record counts somewhat under control for measure values that change very frequently. 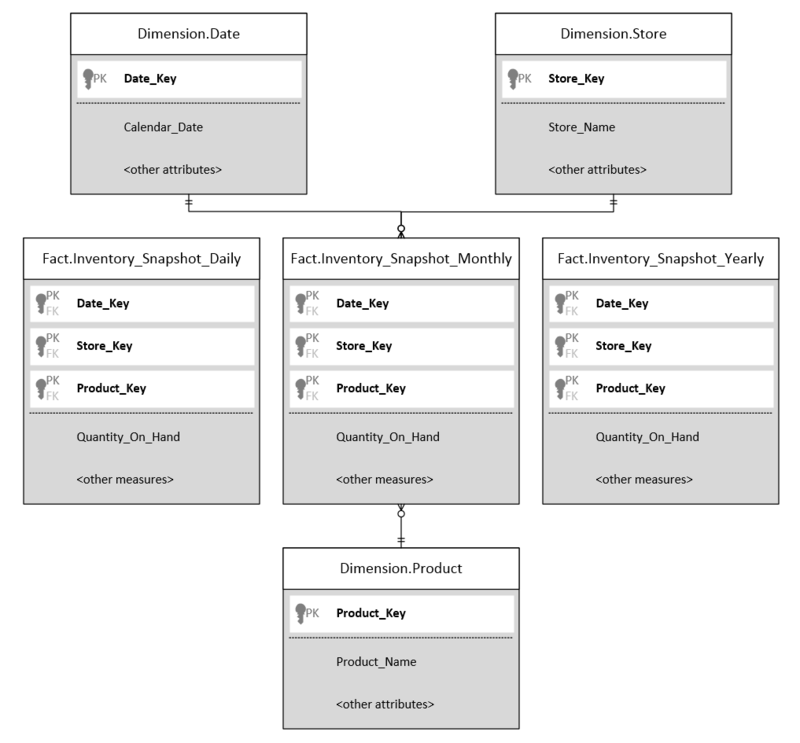 Once the back-end structure is in place, the next challenge to overcome is to find the best way to display these inventory measures in a cube. The simplest method would be to create separate measures for each level of detail (i.e. Daily_Quantity_On_Hand, Monthly_Quantity_On_Hand, etc. ), but doing this creates clutter and confusion for the end user. 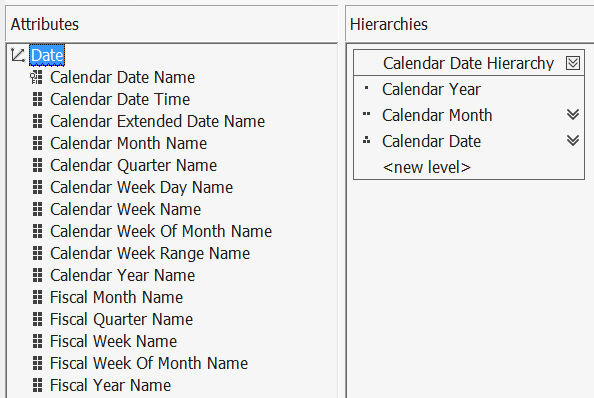 We ultimately need to find the best way to use one set of (visible) inventory measures in the cube, using values from a different fact table depending on what level of the date hierarchy our end user is looking at. 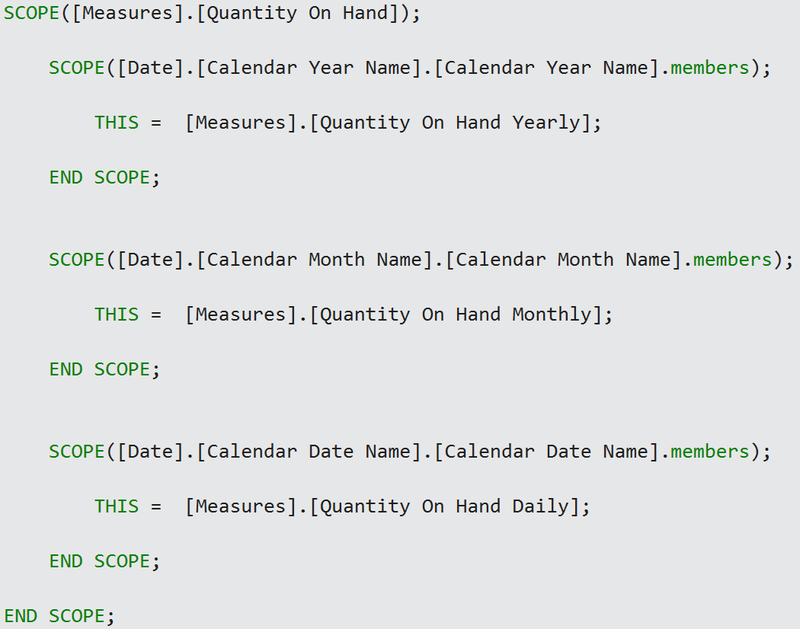 This is where scoped assignments come into play, enabling us to overwrite or replace the values of a measure. Add all periodic snapshot fact tables to the cube. This will create 3 different measure groups in this case…one for each fact table (and level of detail). Add an identifier to each measure, to indicate the grain. In the image below, I chose to add either “Daily”, “Monthly” or “Yearly” for distinction. Remove the word “Daily” from the daily-level measure group name, for display purposes and because we need a visible measure group for our calculated measures. Change the “Visible” property to “False” for all measures in all 3 measure groups. A measure group will not be visible if all the measures within it aren’t visible. Doing this effectively hide the measure groups we don’t want to see, but the measures contained within them are still accessible to our scoped assignments. Note that we’ve used the attribute hierarchies (and not the user hierarchy) in the scoped assignments…which is a recommendation in Chris’s blog posts. 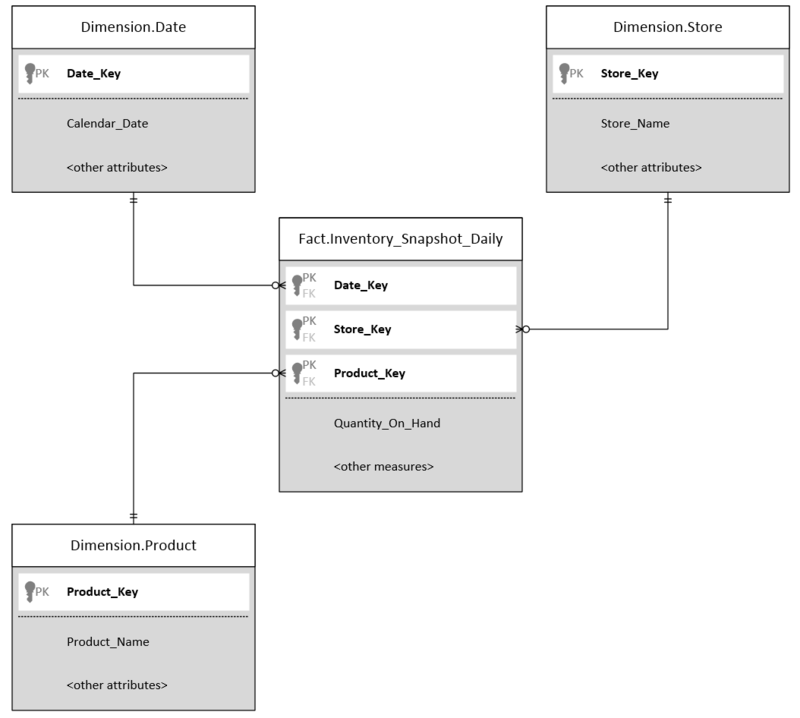 The attribute relationships we defined in our dimension, create the necessary references between attributes and ensures that we still see the correct results…even when using the user-defined hierarchy.